Oakbank - A B Lynn & Co.
﻿Oakbank is conveniently positioned at 516, Bury New Road, Prestwich, virtually opposite Tesco, the development built in 1989 offers all the benefits found in the heart of Prestwich Village, as well as being only a few hundred yards from Prestwich Metrolink station and Marks and Spencer. We are offering one-bedroomed, centrally heated flats at rentals starting from £435 per calendar month, exclusive. 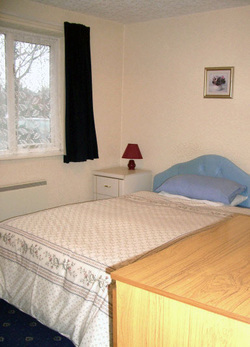 The good sized double bedrooms have decent ranges of fitted robes and matching furniture. The large lounges have leather suites, while the kitchens have good size fridge-freezers. The bathrooms have showers over the baths and the halls boast two good sized storage cupboards. Council Tax is B and B and is presently £1000.p.a. reducing to £750. p.a. for single occupation whilst Water Rates are approximately £300 p.a.